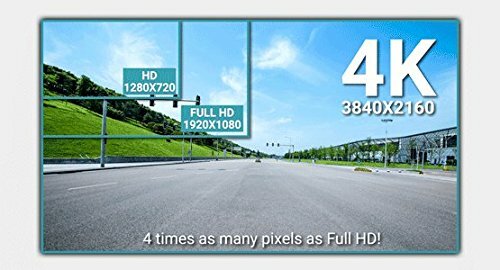 4K UHD is four times as many pixels as Full HD*. This is a huge difference, and it shows. License plates can be made out more clearly and from further away. Front cam: 8 megapixels sensor / 4K Ultra High Definition (3840×2160 @30FPS). Rear cam: 2.1 megapixels STARVIS sensor / Full HD (1920×1080 @30FPS). 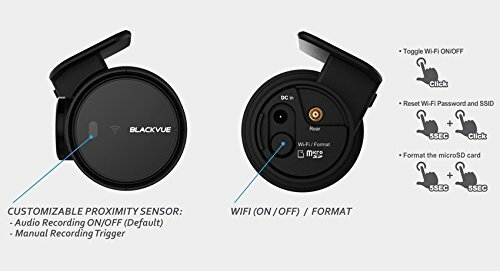 BUILT-IN IMPACT & MOTION DETECTION MARK IMPORTANT FILES AND ENABLE PARKING MODE While driving, your BlackVue detects impacts and sudden changes in speed. While parked, it also detects movements*. BUILT-IN GPS AND DUAL-BAND WI-FI GPS ADDS LOCATION AND SPEED DATA TO YOUR VIDEOS Speed: speed data will be overlaid in the video (can be turned off in the settings). You can set speed display in Kilometers per hour (Km/h) or Miles per hour (Mph). Location: visualize your vehicle’s location in the BlackVue App or Viewer’s Map. 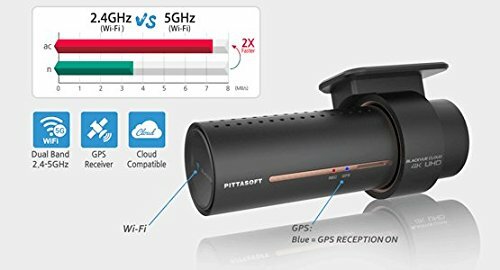 FAST TRANSFER TO YOUR PHONE WITH 5GHZ WI-FI The dual-band 2.4-5GHz Wi-Fi lets you download dashcam videos to a smartphone at blazing speed and allows Over the Cloud functionalities via any Internet-enabled Wi-Fi network. With BlackVue’s Sub-Stream technology, download Quick Play versions of the original videos for even faster review. 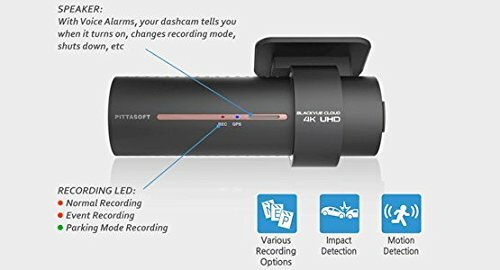 SLEEK DESIGN AND CONTROLS MULTIFUNCTION BUTTON AND CUSTOMIZABLE PROXIMITY SENSOR BlackVue DR900S’ stealthy design incorporates easy access to useful functions. Proximity sensor: toggle audio recording ON and OFF by simply waving your hand in front of it. The sensor can also be configured to trigger Manual Event videos in the settings. Wi-Fi button: turn Wi-Fi ON/OFF (short press), reset your Wi-Fi password (hold until voice prompt, then short press) or format the microSD card (hold until voice prompt, and then hold again). All actions are confirmed by a voice prompt. 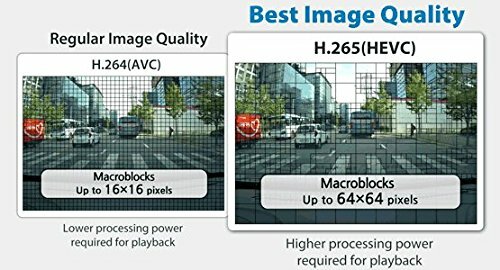 Along with the regular H.264 codec, the DR900S Series features H.265, also called High Efficiency Video Coding (HEVC), the leading standard in 4K recording and broadcasting With H.265, 4K UHD video file size is similar to that of Full HD H.264. In other words, you get 4 times bigger and better images without sacrificing recording time. BUILT-IN GPS AND DUAL-BAND WI-FI GPS ADDS LOCATION AND SPEED DATA TO YOUR VIDEOS Speed: speed data will be overlaid in the video (can be turned off in the settings). You can set speed display in Kilometers per hour (Km/h) or Miles per hour (Mph). 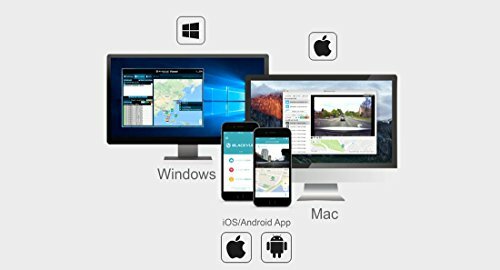 Location: visualize your vehicle’s location in the BlackVue App or Viewer’s Map. 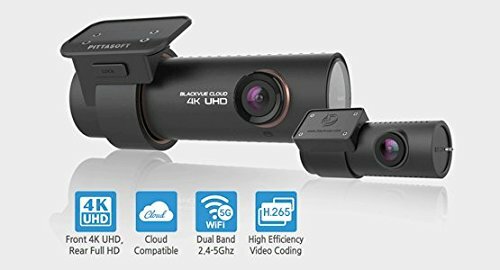 FAST TRANSFER TO YOUR PHONE WITH 5GHZ WI-FI The dual-band 2.4-5GHz Wi-Fi lets you download dashcam videos to a smartphone at blazing speed and allows Over the Cloud funct.